How can I reduce the length of the dendrogram? Also How to increase the font size of the Color Key description? For modifying the font size of the colour key, just use the key.lab parameter (as I do below). For changing the 'length' of the dendrogram, you have to realise that the dendrogram heights are representative of the distances between your samples and are measured on the scale that you used during the creation of the distance matrix, usually Euclidean distance. Euclidean distances can be large, depending on your data-type, even into the 100s. Don't use PNG if you want a very clear image. PNG, TIFF, BMP, etc., are pixel-based. If you instead use a vector-based graphics format, then you would get publication-ready figures. You can then use the width and height parameters in order to modify the size (inches) of the output. 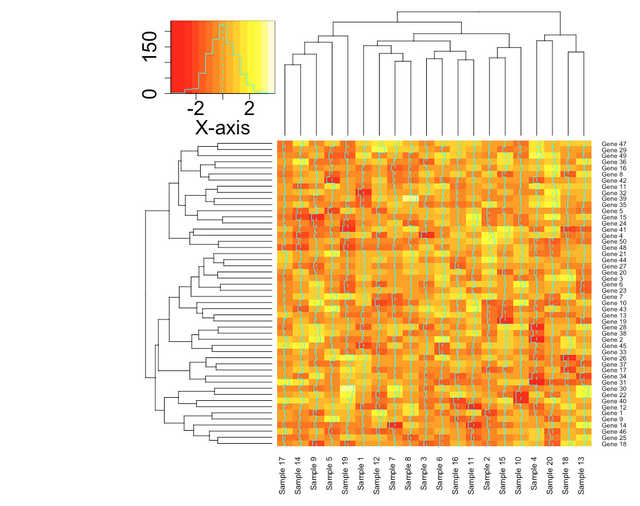 Heatmap.2 - flip dendrogram so control group appears on LHS?